There are a few new developments for cleaning up the Cully airshed. First of all, I, and a member of the Cully Neighborhood Association, and one from Portland Clean Air, met with Mike Smaha, the ‘US Government Affairs’ lobbyist for Owens-Illinois (O-I), the company that owns the Owens-Brockway facility. At that meeting, I encouraged O-I to install electrostatic filters to remove Lead, Mercury, Chromium, and other dangerous contaminants from the Owens-Brockway pollution stream. We had a frank conversation, and even though O-I has installed those same filters at other O-I facilities, there were no commitments that O-I would clean up their act here in Cully. DEQ is now reviewing public comments regarding the Owens-Brockway pollution permit and has stated that they, DEQ, “will incorporate any necessary changes into the permit.” Thanks to all who made comments regarding the permitting of Owens-Brockway. DEQ also issued Owens-Brockway a $12,900 civil penalty in mid-December for hazardous waste violations. They paid the penalty and have taken steps to correct those violations. Lastly, DEQ fined NW Metals $77,419 for violations. Last May, they had a terrible tire fire which led to forced evacuations of Cully residents, and caused injuries and property damage to surrounding homes. DEQ also amended the notice for the property owner, FHA Holdings, increasing the penalty to $43,954. NW Metals/FHA Holdings appealed the initial violations, and the case was sent to Oregon’s Office of Administrative Hearings for a contested case hearing. I have asked DEQ repeatedly how local residents can address this appeal, for I think many of you may have something to say. The process is rather long and byzantine but is described here, at the Oregon Secretary of State’s site, under OAR 137-003-0005, if you are interested. Also, I have changed the name of this grassroots clean air advocacy group to Cully Air Action Telemetry. On a call today with Mary Peveto of NCA, CAAT has decided to guardedly endorse the passage of SB 1541. I hope the residents of the Cully neighborhood and Cully Association of Neighbors agree. I think they do. While SB 1541 is a flawed piece of legislation, it is important to be pragmatic right now and ensure adequate funding of DEQ so that Cleaner Air Oregon can be implemented, and so that we can build a strong environmental regulatory structure for the Cully neighborhood and the state of Oregon. CAAT will continue to work with DEQ and OHA to build this framework. I will try to present some more info about this at the next Neighborhood Association Meeting on Tuesday, March 13th. 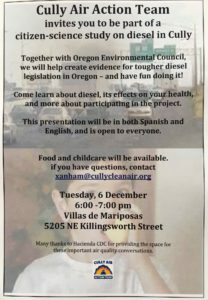 On Tuesday, 6 December, Oregon Environmental Council and CAAT will present a diesel-focused outreach in both Spanish and English to Cully residents. 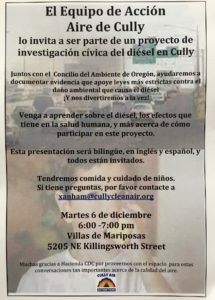 OEC will discuss the effects of diesel on human health and ways in which we are exposed to its particulates, then elaborate on the neighborhood diesel study in which we will participate. Building upon the pilot program in the Lents neighborhood, we will use black carbon monitoring and technology to upload a map which documents our exposure. This will be a fun and informative meeting! Childcare, food and translation are available. 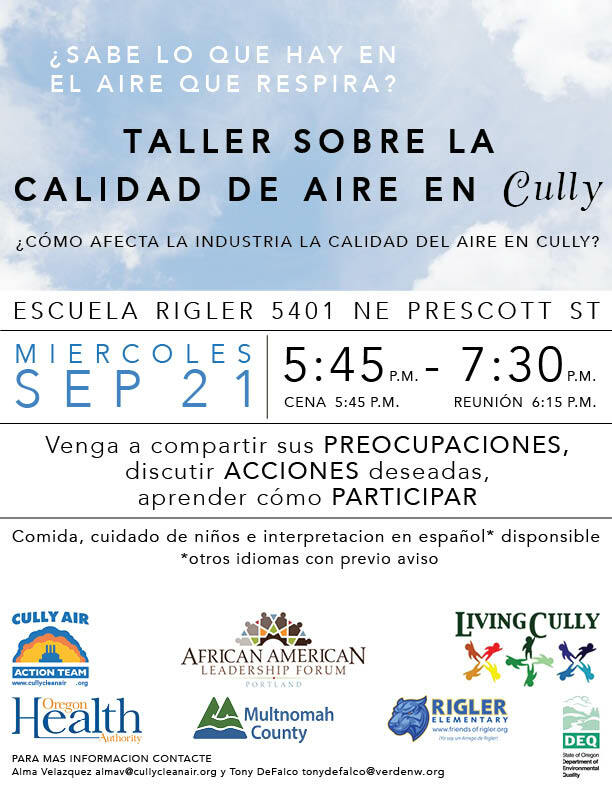 It’s not imperative, but please contact xanham@cullycleanair.org to RSVP for childcare, or for more questions. 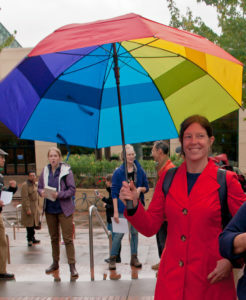 CAAT wants you to come to the Cleaner Air Oregon Public Forum on Wednesday, October 5th! There will be a rally at 5:00pm, before the Forum officially starts at 6:00pm. The forum is schedule to end at 8:30pm. Cleaner Air Oregon wants to hear from people across the state to pass on their views and thoughts to the CAO Regulatory Advisory Committee. This is a VERY IMPORTANT opportunity for Cully to share what is on their mind regarding the upcoming revamping of our air quality legislation. The forum with include presentations by DEQ and OHA staff, and there will be opportunity to give this input after these presentations. If you can’t attend, there will be an online version of the forums available via CleanerAir.Oregon.gov from Sep 13 – Oct 5. 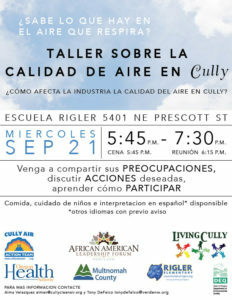 The Cully Air Action Team has been extremely busy and involved in air quality issues over the past few months. 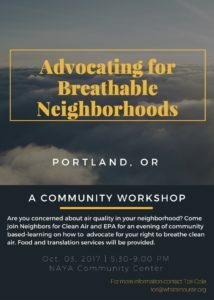 This is the first weekly posting spree, split into several topic-based posts, serving to bring readers up to speed on CAAT’s activism and issues that exist with air quality in Cully, in addition to listing important upcoming meetings and events that people should attend. We all breathe air from the same airshed! July saw the establishment of a weekly, 30-minute call-in conversation with representatives of the Department of Environmental Quality (DEQ), Oregon Health Authority (OHA), Multnomah County, to discuss the many air quality issues that affect us, in Cully: Heavy industry with little or no air filtration; several high-use transportation corridors; the Port of Portland; Forest Service moss results; Air Quality informational meetings; specific polluters I will mention, below. The United States Forest Service (USFS) moss samples indicated that Cully is the most polluted neighborhood in all of Portland. From this data, DEQ decided to establish two air monitors in Cully. One air monitor was located on 1 Sep at Parkrose Deliverance Tabernacle on NE 57th & Portland Highway, while the second is at a BES Pumping Station on about NE 62nd, north of Columbia Highway, placed 19 Sep. Both air monitors are functioning, with data collected daily by DEQ. To complement these monitors, a meteorological data station has been mounted atop Living Cully Plaza. On 1 Oct, DEQ will begin to analyze 30 days’ worth of data from the first monitor, in addition to corresponding meteorological data, and we are told to expect results sometime mid-Oct. These results will indicate what has been in the air for 30 days, but unfortunately will not pinpoint the source of the heavy metals. If the results show that there is a level of heavy metals that exceeds state health benchmarks, OHA will take some form of action to alert public. Cully is a historically underserved community, the largest and most diverse neighborhood in Portland. There are issues of environmental justice and unheard voices that need to be immediately addressed. This is a fantastic document, listing all the moss sample sites throughout the city, and the corresponding metals found in each sample. Although I knew Cully was bad, I hadn’t considered all the metals measured in the samples, as Bullseye and Uruboros were gathering attention for Chromium, Cobalt, and Arsenic. Thus, when I looked at the sample from two blocks away, I was astounded to see the aluminium measured the worst in the city. Everyone should look at their closest moss samples to see what was collected. It is difficult to envision air pollution amidst blue skies and gorgeous days. The Cully Air Action Team met and discussed the items below. If you are interested in joining us for our next meeting please contact us here. 1. Regular meetings: We want to meet regularly and have agreed that for now, it works to meet once per month on a Sunday morning for anywhere from 1 to 2 hours. The next meeting will be Sunday, August 7th, at 10 a.m. Those who can are encouraged to bring a brunchy treat. 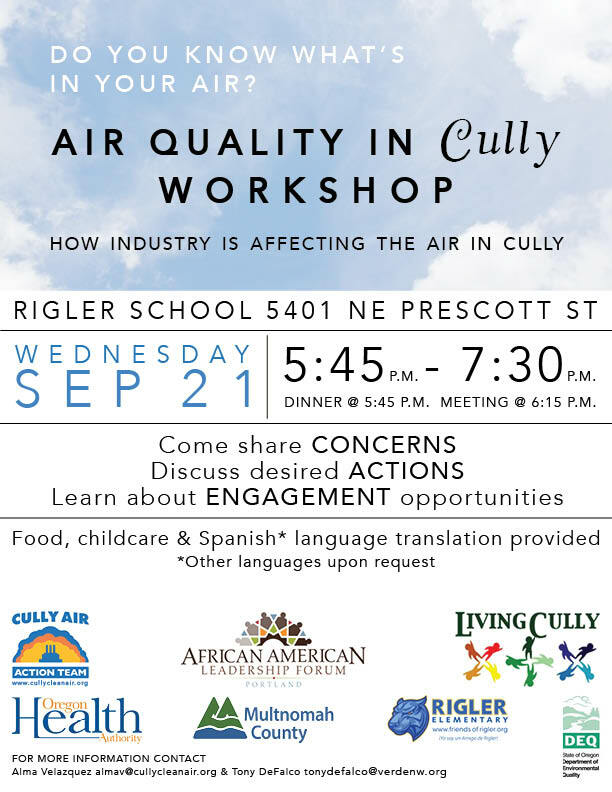 Living Cully: We are currently collaborating with a variety of community groups and organizations, representing the interests of neighbors in Cully around air quality. 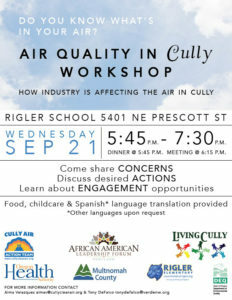 We are aligned with Living Cully in our efforts to get monitoring in the neighborhood from DEQ. That appears to be moving in the right direction. We will be engaging in weekly check-ins (conference calls) on the monitoring topic to get updates, get our questions answered, etc. These weekly calls are an opportunity to bring up other issues that interest us and that we think DEQ can address, such as the ongoing stink problems with Porter Yett and Tina’s response so far. We want to bring this up in the next conversation as it appears that Nina is more responsive, so maybe she can help us. The next phone call with DEQ is scheduled for Thursday, July 14 at 12 noon and every Thursday thereafter t 12 noon. Gregory, Xan and Alma are invited. Let one of us know if you want to add a question/comment to our list. Additionally, we’re looking at the things that Xan mentioned in her previous update about that last meeting with DEQ. We want to continue to collaborate with Living Cully as we feel this has been a very positive experience so far and Tony’s goals for environmental justice is aligned with ours, and the relationship is good. Portland Clean Air: We have worked with Greg B and Seth W from PCA in the past around permits, mapping, and creating a fact sheet for Cully (this last one is ongoing). PCA conducted some canvassing in our neighborhood and as a result they have an additional 50 or so members who live in Cully. They want to pass the group to us so we plan on a joint communication to invite those folks to join CAAT. Alma is working on that with Greg B from PCA. Thinking that we can plan for a meeting perhaps in late August or September for people interested in joining us. I’ll look into a venue, like a library community room. PCA is also put a spectrometer to measure VOCs in a safe place and it could be moved to Evans since she lives closer to Porter Yett. We’re hoping it could capture the type of data that the DEQ monitors won’t because those monitors only measure metals. Big Tent Coalition: Xan is in touch with Mary Peveto of Neighbors for Clean Air and others as part of a coalition looking for statewide solutions to diesel. Spokes Council: We’re also involved in discussions about a spokes council with PCA, EPAC and other groups. Gregory is our point person for that. 3. Updating the website: Our site needs content! Can you please check it out, check out what’s been posted before and let us know what kind of information would make it more relevant for folks wanting to join our group. Gregory is in the process of updating our name to CAAT. Meanwhile, what else should we include? What is the Cully Air Action Team? Due to adverse planning that regarded residents as second-class citizens, industrial development was located along the Columbia Slough, and a large dump placed near the Union Pacific rail line. Some of these areas have been remediated, including the new Thomas Cully Park, while others allowed to continue polluting the air and groundwater. To address the recurrent noxious odors, the Cully Stink Team has focused much of it’s efforts on the Porter W. Yett asphalt facility, just south of the rail line by NE Cully Blvd. and NE Columbia Blvd. This facility uses bitumen from the Athabasca Tar Sands region. These petrochemical products comprise some of the dirtiest carbon resources currently in use and their refining has led to a cancer epidemic among the Athabasca, the Peace River and other First Nation peoples of Alberta, Canada. In making asphalt, the Porter Yett facility releases sulfur compounds, benzene and other VOC/PAHs, carbon monoxide, and PM2.5 and PM10. Some of these compounds are carcinogenic and the others can cause respiratory difficulties and diseases including emphysema, bronchitis and asthma. Synergistic effects have, of course, been poorly researched. Porter Yett is just one of numerous industrial polluters, including Boeing, the Oregon National Guard, and Owens Brockway glass recycling. Cully residents have repeatedly contacted Oregon State DEQ officials, filed verbal and online complaints and spoke with local elected officials about odors and toxicity. The DEQ’s response has been inadequate. The DEQ seems conditioned to weigh industrial concerns with more emphasis than local community members health concerns. We are pushing for a shift away from this legislative danger, aware that many of these pollutants have negative long-term health effects as well as short-term negative comfort effects. We want, at a minimum, for the DEQ to represent people and protect the health of the community. We want consistent monitoring, unannounced in advance to industries, to identify point source contaminants and all carcinogens. We want effective regulations imposed to eliminate these poisons and carcinogens from entering the environment. Cully has recurring and severe airborne stink events. Numerous complaints have been filed with DEQ yet nothing has been done to address the current airborne stink event. As taxpayers, homeowners, community members, locavore farmers, gardeners, and breathers we demand the DEQ move swiftly to eliminate carcinogens and other pollutants that are dumped, pumped, or combusted into the Cully biosphere.